I decided to do it at the last minute. As a matter of fact, it was the last day of October before I even remembered that it was happening. I am talking, of course, about National Novel Writing Month, known to its many fans and bragging, battle-scarred veterans as NaNoWriMo, or simply NaNo–that crazy annual internet challenge where aspiring writers strive to crank out 50,000 words of a first-draft novel in just 30 days–during the already insane month of November. I have participated in NaNoWriMo eight times previously, and have “won” – that is, met the 50,000-word goal — all but one of those times. But taking it on this year was a special challenge for me. This year, I felt almost as if I were playing–and that’s how I always think of it, as joining in a game–for the first time. The actual first time I played in NaNo was November of 2007. I was recovering from two of the most exhausting and challenging years of my life. In mid-2006, I was diagnosed with stage-one breast-cancer. During and after two surgeries, two debilitating hits of chemotherapy (I chose to stop after that–which is why I sometimes joke to friends that I “flunked” chemo), radiation treatments, and in the midst of post-op hormone therapy, somehow I discovered the urge to write again. My desire to write has always been the truest barometer of how I’m really feeling–mentally, emotionally, physically. I gave birth to my son in January of 2002, and recovery from the attendant c-section was slow. Still, at some point when the baby was about four months old, I stole a few moments while he was napping to grab a pen and notebook and begin journal-writing, something I’d fallen away from during the busy-ness and exhaustion of new-parenthood. At the time, I felt as if I was doing something vaguely illicit, “stealing” time for myself and my thoughts away from my new parenting identity and duties. But that time spent with pen in hand was nourishing. It didn’t matter what I wrote–a bad poem, a snippet of observation, a story idea, a character sketch for a bit of fiction, or even just a list of things I’d done that day–as long as I wrote something. That, to me, was a message from my own mind and body that I was starting to get well. The urge to write was and is, to me, the urge to rejoin the world. Similarly, as 2007 wound to its end, I was starting to come out of the chemo-and-radiation-induced fog of exhaustion that had slowed my life to a snail’s pace for months. During the worst of this, I would lie in bed as my husband took our toddler to preschool before he went to work. In the silence of the house after their departure, I would go back to sleep, or lie awake until I felt energetic enough to move to the futon in front of the television, where I would watch whatever PBS kids shows were running, usually in a state of zoned-out exhaustion, waiting for my body to gather sufficient energy to allow me to get up again, let the dogs out, and manage something to eat. And so it went. By the time J.K. Rowling’s final Harry Potter book appeared in October, I was no longer so continually exhausted, and I remembered that, yes, I liked to read. So I finished Harry Potter and the Deathly Hallows, and then read another fantasy novel, Sorcery and Cecilia, or the Enchanted Chocolate Pot, a faux-Regency novel featuring magic, which in turn reminded me of how much I liked Jane Austen–and also made me want to write fiction again. 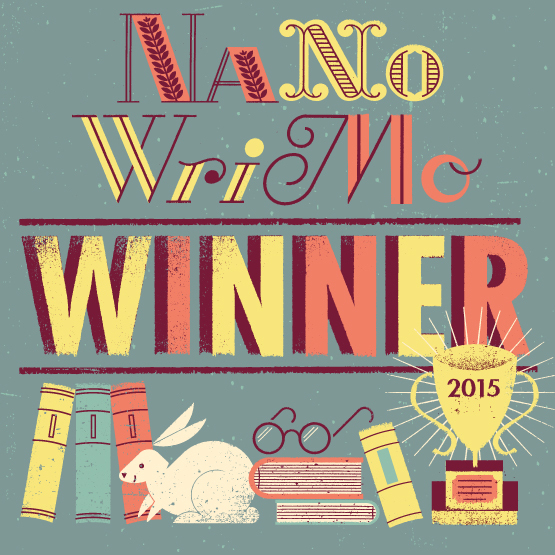 A friend recommended that I sign up for NaNoWriMo. As I was soon to discover, my perfect storm had arrived. I had never before realized that simple things like a deadline and tracking one’s word-count could be such huge motivators. Every day, as soon as my son was off to school, I would park myself at a laptop perched on the kitchen table and type like mad.Over the days and weeks that followed, I began to think in terms of word-counts and daily quotas. I broke through innumerable plot hang-ups and fits of writer’s block by stubbornly typing through my own anxiety and/or inertia to hit that daily word goal. I would “sneak” novel writing in at odd times – during lunch break at an autism conference, in an upstairs bedroom while visiting my in-laws over Thanksgiving, any time my son wanted to take a nap. There was something empowering about watching those words pile up, literally feeling the story grow under my hands, barging my way through stretches of uncertainty just by continuing to move forward, and alternately coasting through those sections where the words just flowed like water. I even compared my daily totals against the posted word-counts for other writers in the Ann Arbor and metro-Detroit area (a nifty feature of the NaNo website lets you see the combined word counts generated in different locales, and by individual writers in any online communities you join). And here is possibly the weirdest thing: I was writing in solitude, but at the same time I felt myself part of a much larger, world-wide community of thousands of people, all typing their fingers off to finish those rough-draft novels. When I got stuck, I would write long-hand, sometimes for pages a time, and then later transcribe. I told everyone what I was doing, and was shocked by how many of them actually seemed stunned or even impressed. For one month out of my year, I publicly identified myself as a writer and completely gave over to my writing impulse. Almost everything else — except making sure that I, the kiddo, and the dogs were (reasonably) clean and that everyone got fed–was secondary to making that damned word-count each day. I did it again the year after that, and I got probably a better-structured draft the second time out, since I had a better idea what I was doing. By year three, my storyline was starting to feel a little worn, but the thrill of doing the word-count remained. By 2010, I had discovered Thomas Paine, and Paine-esque heroes and quotations became my stock-in-trade for the next two NaNo sprints I did, re-invigorating my own sense of what fiction could be, what it could tackle and encompass. At the same time, almost everything I wrote continued to be in that same half-magic faux-Enlightenment universe that I had first created in 2007. But eventually, school work, complications in my domestic life, and a general sense of being overwhelmed and “too busy” got in the way of my NaNo participation. My efforts fell short of the finish-line in 2013, and I didn’t play at all in 2014. But this year, being newly divorced and starting a new life in a new apartment, and having made a commitment to take my writing seriously–I decided on the spur of the moment, on the last day of October, to take that wild ride again, and to give an entire month over to my writing. I wrote any time and everywhere, even during a weekend sci-fi convention in Chicago, on the plane to get there and on the plane coming back. On the very last day of November, I racked up my final six thousand words with the help of dictation software, and crossed the finish-line well before midnight. Despite feeling completely wiped out, I also felt recharged, just as I had when I completed my first NaNoWriMo effort in 2007. I had just drafted a novel in thirty days. What else might I finish if I threw myself into the task with the same kind of commitment and self-abandon? In the coming year, I hope to find out. Next time: The specific writing lessons that I took from my NaNoWriMo experience, along with a peek at what I wrote and how I plan to revise.